Tribute 1 Dragon monster, then target 2 cards on the field; destroy them. You can only activate 1 "Guardragon Cataclysm" per turn. 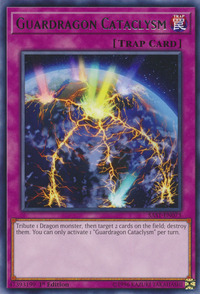 The lights appear in this card's artwork refer to the location where the seven World Legacy are found. The spots of each location are supposed to create a cross. The symbol on this card also appears on Mekk-Knight of the Morning Star's and “Galatea, the Orcust Automaton's” chest as well as the backgrounds of Orcustrated Core and Orcustrated Release. Each time this symbol has appeared, a tragic event has occurred. This card can be seen as a Dragon equivalent to ”Icarus Attack”, albeit only one copy can be activated per turn, unlike the latter.